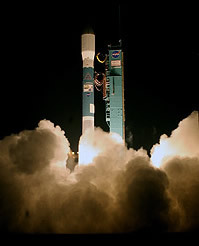 Delayed again during the week, this time due to bad weather, the Delta 2 launcher finally lifted off from Vandenberg Air Force Base (California) last Friday night (28-29 April). The launch sequence went without incident, inserting Calipso into a perfect orbit. The receiving stations in Aussaguel (near Toulouse, France) then Kiruna (Sweden) immediately transmitted telemetry data confirming the solar arrays had deployed and the flight programme had initiated correctly. All manoeuvres and initial power-up of the satellite bus were completed to plan. Positioning operations will be performed by CNES’s technical teams in Toulouse, who took charge of Calipso after launcher separation. The satellite will reach its final orbit in about 40 days. Nozzle calibration operations will be performed on Wednesday 3 May, followed by power-up of the 1st payload instruments at the end of the week. Calipso will fly as part of the A-Train. It will acquire vertical profiles of Earth’s atmosphere and provide a unique data set. Data from this full-fledged space observatory will be processed at the Icare centre (Interactions Clouds Aerosols Radiations Etc. ), set up under a partnership between CNES, the French national scientific research centre (CNRS), Lille University and the Nord-Pas-de-Calais region (northwest France). CNES President Yannick d’Escatha expressed great satisfaction and congratulated the teams for the successful launch of this French-US project, which he said: “…marks a new milestone in the ongoing cooperation between France and the United States in the field of Earth observation and heralds great things to come…”.